Introducing new types of facilities to transportation infrastructure can be perceived as a daunting engineering challenge because of fears of liability associated with something that isn't uniform or standard. The MUTCD is often the first document that engineers go to when identifying what's possible. Adopting facilities from Europe or other parts of the world that aren't described in our typical references make a project difficult to imagine because there isn't experience with those types of facilities. 09 Center line markings shall be placed on all paved urban arterials and collectors that have a traveled way of 20 feet or more in width and an ADT of 6,000 vehicles per day or greater. Center line markings shall also be placed on all paved two-way streets or highways that have three or more lanes for moving motor vehicle traffic. 10 Center line markings should be placed on paved urban arterials and collectors that have a traveled way of 20 feet or more in width and an ADT of 4,000 vehicles per day or greater. Center line markings should also be placed on all rural arterials and collectors that have a traveled way of 18 feet or more in width and an ADT of 3,000 vehicles per day or greater. Center line markings should also be placed on other traveled ways where an engineering study indicates such a need. 11 Engineering judgment should be used in determining whether to place center line markings on traveled ways that are less than 16 feet wide because of the potential for traffic encroaching on the pavement edges, traffic being affected by parked vehicles, and traffic encroaching into the opposing traffic lane. As a practitioner that traveled to The Netherlands several years ago, one of the treatments commonly used on Dutch streets is advisory bike lanes. The step that's necessary beyond "violating" the normal use of a centerline is to make the bike lanes striped (dashes as shown below) and in this case, the space for cars in between the dashed lines may be less than what's normally used for striped lanes in both directions. 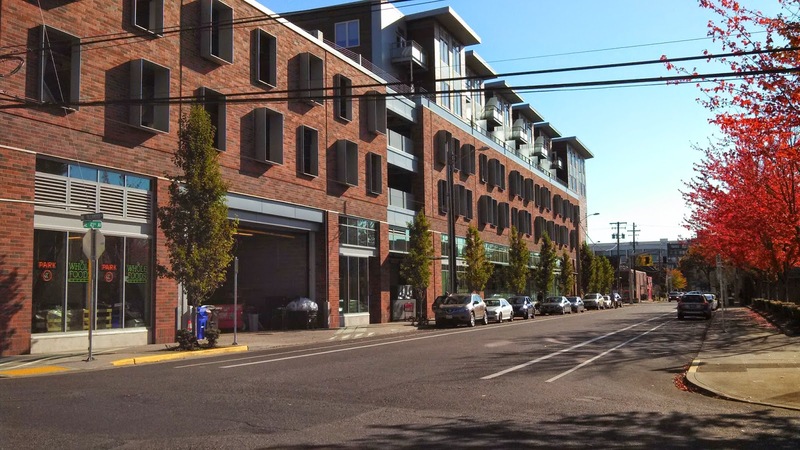 Thus, the width of that interior space is less than 20 feet and was measured to be as narrow as 16 feet with 5 foot bike lanes on both sides in the example here. 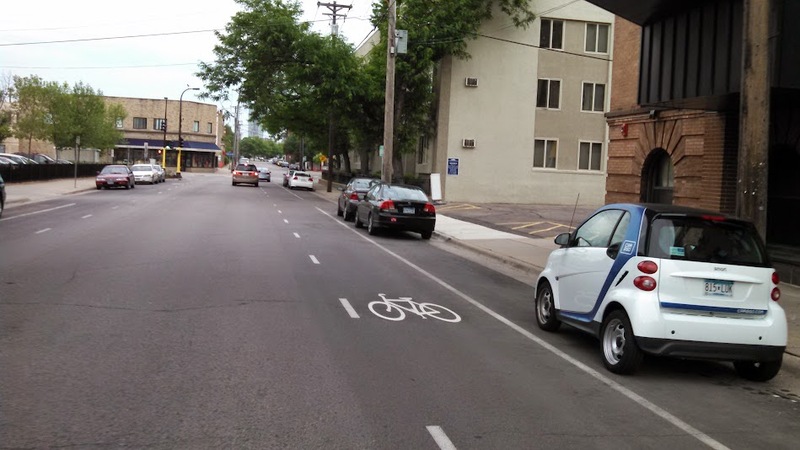 Minneapolis has implemented advisory bike lanes on East 14th Street. Riding on this street, I found it worked well (it was off-peak travel times) because of the low traffic volumes and low speeds. In our six block ride along the street, we never encountered cars passing each other at the same time, so when a motor vehicle did need to pass me, the person passed with a very comfortable amount of space (likely due to the elimination of the center line). 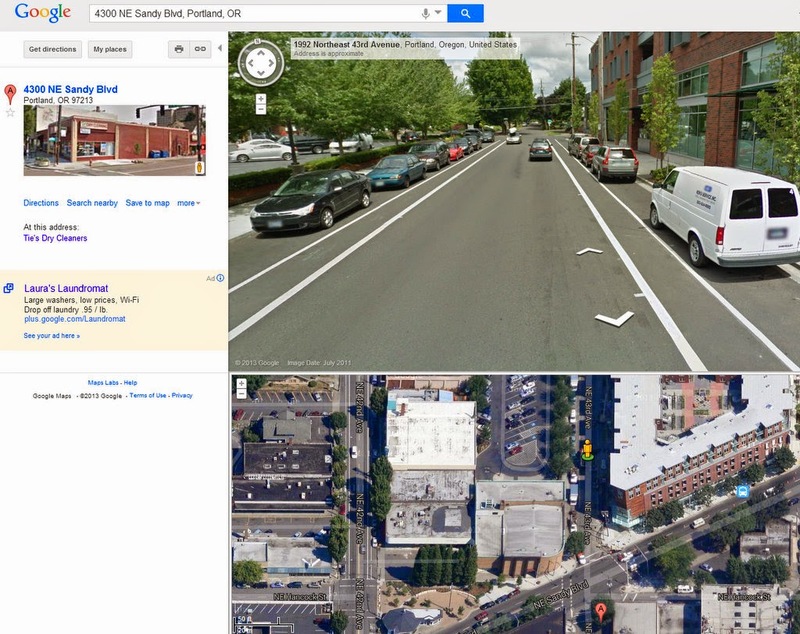 Advisory bike lanes or bike lanes without a centerline on a street (as shown at right) have been used sparingly in Portland. There has been some elimination of centerlines where the traffic volumes do not warrant the maintenance necessary to keep them marked. The volumes and the speeds are of interest. There's some interest in measuring before and after speeds, to determine whether the street is more comfortable for people on bikes. The takeaway from this experience is that APBP is a great convener of ideas that should guide those involved with information on new facilities. This information can be used to move bicycle and pedestrian infrastructure forward. Interestingly enough during my research on the topic, APBP had a summary article based on some listerv discussion on Advisory Bike Lanes back in 2009. It would be ideal to get information from the members of the listserv related to what are the most critical issues that should be in the next edition of the Manual of Uniform Traffic Control Devices. One of the challenges of APBP is to make sure that we are working with engineers that have access to available resources like this City of Minneapolis Request to Experiment (linked above). Yet, if only Minneapolis is implementing this sort of treatment, the treatment can be viewed as a singular interest that doesn't get widely adopted or considered for the MUTCD.